Freehold is one of the largest townships in Monmouth County NJ, serving as a sizable residential community for many who commute to nearby cities for work. Great public transportation options make it easy for residents of Freehold to get where they need to be, including Newark, Manhattan, and Philadelphia. These same commuters can count on healthy homes inspected by the experienced Freehold NJ Home Inspector, ‘Jersey Strong Home Inspection’. Freehold was originally home to the Lenape Indians. European settlers who followed included the English, Scottish, and the Dutch. Freehold Township was active throughout the Revolutionary War and many landmarks remain, showcasing its historical significance. Because of this, population growth in the 19th century continued into the 20th including the arrival of big industry to the Freehold Township. Industries make Freehold that much more attractive for those looking for a town in which to live, play and work! Established 1853, Freehold Raceway not only offers horse lovers and gamblers an opportunity to visit harness racing locally but they do it in the nation’s oldest half-mile harness racing track. Nearby Freehold Raceway Mall is a high-end shopping mall with gross leasable space of 1,600,000 square feet. This is the second-largest mall in the state of NJ. Freehold homeowners benefit from these local establishments as well as the Freehold NJ Home Inspector services of ‘Jersey Strong Home Inspection’. The quality of life in Freehold NJ is important to its residents. Because of great parks and a committed recreation department, Freehold is thriving. That quality of life is enhanced knowing home inspection services ensure their home’s structure and systems are in good condition. 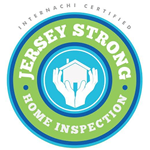 Contact the team at ‘Jersey Strong Home Inspection’ today to schedule your Freehold NJ Home Inspector appointment. In addition to a standard NJ home inspection ‘Jersey Strong Home Inspection’ can inspect for termite damage and/or the presence of radon. Let our knowledge and experience serve as your guide to home inspections in Freehold NJ.